The sport of fishing is constantly changing and adapting to new technology and trends. We recently took a look at some of the most realistic lures that modern manufacturing techniques can create. 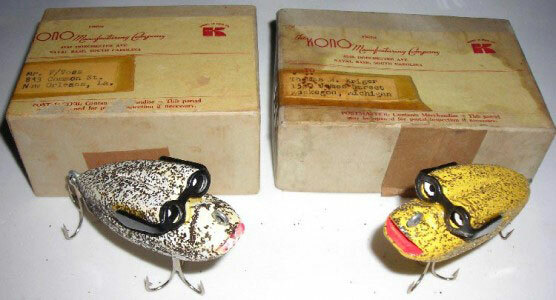 In this article, we will take a look back at some of the innovative and unique fishing lures from the past. 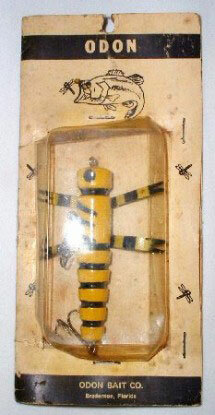 This lure was made by Kono Manufacturing Company in Naval Base, SC. The company made eyeglass frames and goggles. 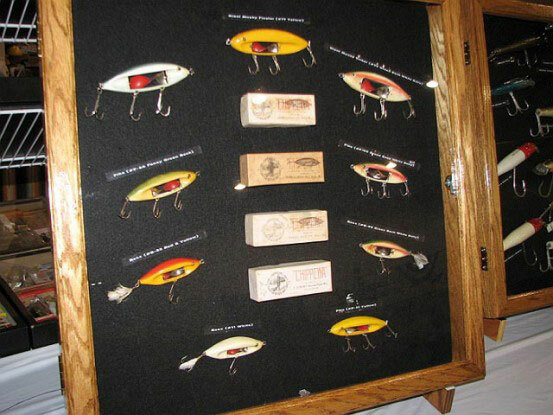 These lures were given away to optometrists and dealers as promotional items. The lure is wearing a pair of glasses, and the paperwork has the slogan 'Modernize for Modern Eyes'. 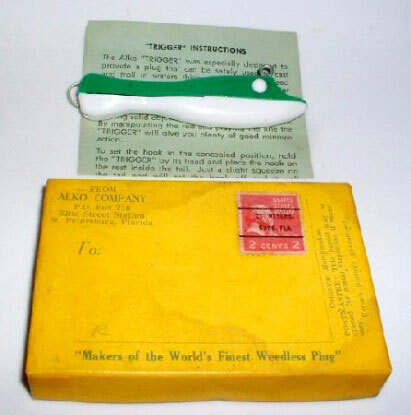 This lure was invented around 1909 by Omer F. Immell, and was made by Immell Bait Company in Blair, WI. It was available in several different sizes and in both floating and sinking models. It features a metal spiral in a gap in the body of the lure. The spiral spins when the lure is retrieved. 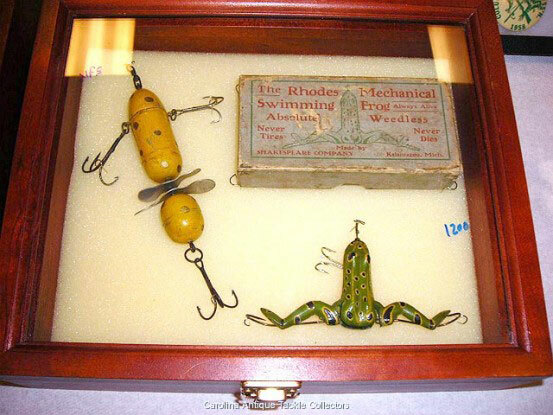 These lures were made by R. L. Clewell Manufacturing in Canton, OH. They were made out of molded rubber and have a weight attached near the line tie. 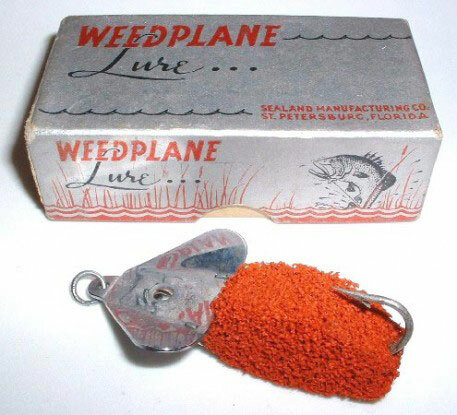 This unique lure was made by Sealand Manufacturing Company in St. Petersburg, FL. The lure has a metal lip and hook, and the body is made out of sponge. The sponge protects the hook from weeds, in a similar way as a Texas rigged soft plastic lure. This lure was made by Shakespeare in Kalamazoo, MI. It was designed so that the legs kick back when the line is tugged. It was made out of rubber and has a lead weight in the belly to act as a ballast. This lure was made by Odon Bait Company in Bradenton, FL. The name was taken from odonata - the order of insects that includes dragonflies. The body of the lure was made out of wood, and the wings were made out of rubber. This lure was made by Alko Company in St. Petersburg, FL. 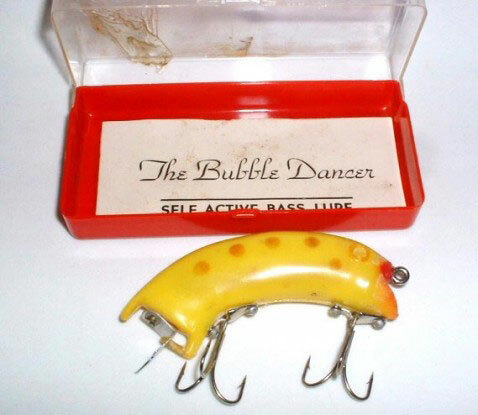 It is a hard plastic lure that features a spring loaded hook. The hook remains concealed in the body of the lure until it is squeezed, allowing it to be used around weeds without getting hung up. This lure was made by Brooks Marine Supply in Jacksonville, FL. This hard plastic lure has a hollow air chamber inside. When retrieved, water enters a port at the front of the lure and forces air out a port in the rear. These leaves a trail of bubbles in the water. All of the photos in this article are courtesy of Joe Yates. 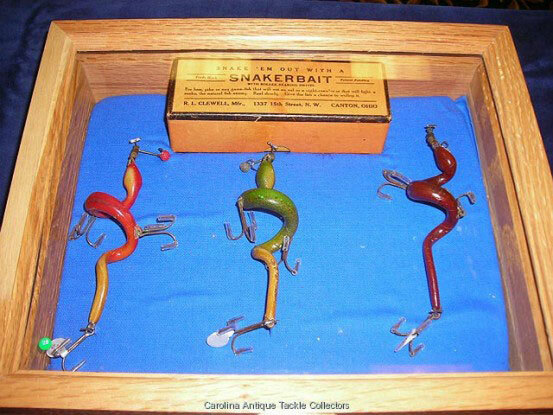 Visit his website to see his amazing antique fishing lure collection - www.joeyates.com.